Engage your brain with your wardrobe ... how company culture influences your interview attire. We believe that what you say and do in the interview itself will ultimately determine whether you get the job; a good CV takes precedence, but first impressions are definitely important in the whole process. The interview should be focused on the message you’re trying to convey, your clothing shouldn’t distract from the substance but should always help you present yourself in the best possible light. As soon as you walk into the interview room, your prospective employer will be forming an impression of you that will last a lot longer than the interview. First impressions take seconds and during that time a complete stranger will formulate an opinion of you based on your appearance. Not only is it important to adhere to 'non-negotiable' standards such as modesty, ironed clothes and well groomed nails, but it is important that your wardrobe understands your role. For example, we see many start-up companies with very creative spaces where employees are encouraged to bond and mingle. Hence, the culture represents a more casual approach to what employees wear to work. Some employers set a more formal tone; it differs from place to place. That's why it's important to research a company culture before heading into your interview. Your presentation of yourself is part of your non-verbal communication - companies tend to hire who they think fits with the rest of their team and with their culture. However, we would always recommend a candidate 'over dress' in terms of being smart, rather than be too casual! For example, it's best to err towards a 'classic' look with well tailored suits avoiding loud patterns, large accessories, heavy jewelry and sleeveless dresses. 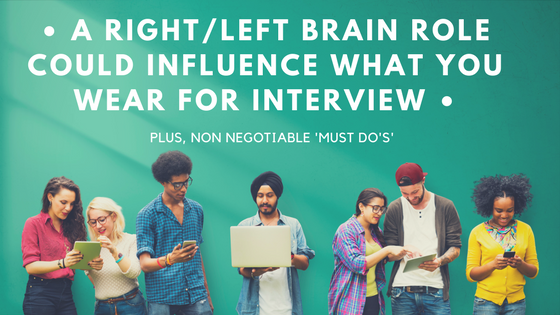 We found this subject interesting given our recent blog about right brain/ left brain suitability in certain careers. It would seem many right brain led jobs (in the creative arts and in roles such as learning and development), have more of a propensity towards a more ‘funky’ or casual wardrobe when it comes to job interviews. Left brain people dress more conservatively and conform to what their peers are wearing in the office environment. Again, in the wider picture, it's about showing you have done your research into the company and its culture. Most of our candidates who interview for jobs at a senior level in finance and law are extremely professional and have a good sense of what the employer expects. Our female candidates understand the importance of smart dresses, skirt suits or trouser suits that are well tailored. First impressions say confidence and self-assurance; important qualities in any candidate. When it comes to nails, a neutral coloured polish is good; save the sparkly patterned nails for holiday mode! For male and female candidates it goes without saying that shoes shouldn't be too worn or scuffed, clothes should be pressed, nails and hair are tidy. We see so many quality candidates in this sector. It's a very competitive market and landing a top role in a tech company or start up requires the candidate to be super sharp. During the interview you have to really stand out and be convincing that you are the right person for the role. Popular culture portrays top executives in the technology sector as hugely successful even while wearing jeans and t-shirts to work. Yes, you can be casual if you interview with a tech start-up but there are limits. If you want to fit into a young, hip team you don't need to look like you just rolled out of bed! Those same 'non-negotiable' standards still apply, but you can be a bit more free and creative with your outfit, for example black jeans, a tailored white shirt and blazer. We at Kendrick Rose firmly believe that if you know you are well prepared, dressed suitably and appropriately, it will be a lot easier to focus on ‘selling’ yourself because you are in the right frame of mind. We are happy to help you with your interview and offer advice on any aspects this blog may have raised.